Drafted by Seattle in 2016, now moving the ball up field for the Baltimore Ravens. On Card Autograph in blue ink. PANINI SPECTRA FOOTBALL. DUAL AUTO PATCH. BOTH THREE COLOR PATCHES. 11/15. SP. 1/1Ebay. Sweet Card. Card No. ROPA-ARK. For sale is a2016 Panini Infinity ALEX COLLINS RC ROOKIE Auto GOLD serial numbered 6/8. 2016 Panini Immaculate Collegiate Football. Alex Collins. Rookie 2-Color Patch Autograph 38/99 Card #116. 2016 PHOENIX ALEX COLLINS ROOKIE RISING RED, #240/349, LOOK!!!!!! CARD IS #RR-AC AND SERIAL #'D 240/349. 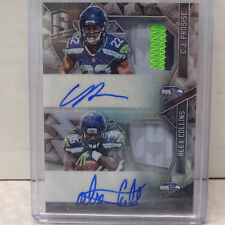 This card is a 2016 Panini Encased Alex Collins Rookie Notable Signatures Auto RC SSP #5/10. The card pictured is the card that you will receive. This card is in NM/MT condition or better. 2016 PHOENIX ALEX COLLINS ROOKIE RISING RED, #217/349, LOOK!!!!!! CARD IS #RR-AC AND SERIAL #'D 217/349. 2016 PHOENIX ALEX COLLINS ROOKIE RISING ORANGE, #184/299, LOOK!!!!!! CARD IS #RR-AC AND SERIAL #'D 184/299. UP FOR SALE IS A... 2016 Contenders #321 Alex Collins Autograph Rookie Ticket RC Formerly Of the Seattle Seahawks and now of the Baltimore Ravens Please see scan for exact condition. Card has been stored in a penny sleeve and toploader and kept away from the light. Only taken out of protection to be pictured so you can see any imperfections when buying. Card will be shipped in a toploader and team bag packaged securely inside of a bubble mailer shipped via USPS. 2016 PHOENIX ALEX COLLINS ROOKIE RISING RED, #252/349, LOOK!!!!!! CARD IS #RR-AC AND SERIAL #'D 252/349. 2016 PHOENIX ALEX COLLINS ROOKIE RISING RED, #166/349, LOOK!!!!!! CARD IS #RR-AC AND SERIAL #'D 166/349. 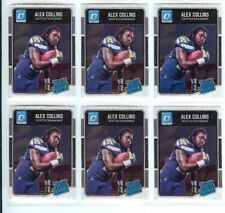 2016 PHOENIX ALEX COLLINS ROOKIE RISING 3 CARD LOT, LOOK!!!!!!!!! You are looking at a 2016 Panini squires authentic player worn jersey card of Alex Sanders #38. This card is number 151 from the Rated Rookies Purple set from 2016 Donruss Optic Football. Team - Seattle Seahawks. Team: Seattle Seahawks. Year / Season - 2016. Find More 2016 Football Cards Here! It's Alex Collins's 2016 Panini Prizm Premier Jerseys card #PPJ-AC.